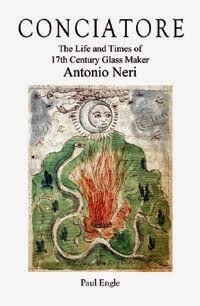 Antonio Neri devoted the fifth part of his book on glassmaking, L'Arte Vetraria, entirely to the production of "paste gems." These are pieces of intensely colored brilliant glass crystal used to imitate gemstones. The name "paste" comes from the way they were produced. A finely ground powder, resembling pasta flour, was mixed wet in small batches like dough. The mixture starts with crystal clear pieces of quartz rock crystal. Neri "dresses" them by chipping off any impurities or dirt. He then repeatedly heats the quartz in a covered crucible and then dumps it out into clean cold water, which causes it to fracture into smaller and smaller pieces. He advises doing this at least twelve times, stressing the importance of keeping out contamination, avoiding embers and fly ash, which require a clean burning fire. 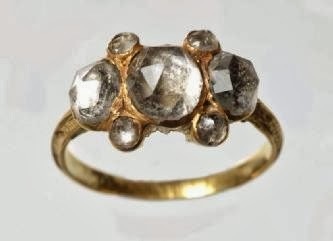 Next, he works the fractured quartz, which should "crumble and decompose like refined sugar." He grinds it on the porphyry stone with a muller to reduce it to the finest powder; "like sifted grain flour. […] Grind it one time, grind it again and then make another pass. Always put only a little onto the porphyry, which is to say half a spoonful at a time." In another part of the book, Neri recounts a glassmaker's proverb which is apt for this process: "A fine sieve and dry wood bring honor to the furnace." He mixes in a quantity of "minium" which is an orange or red mineral consisting of lead oxide. This material acts as a "flux," which dramatically lowers the melting temperature of the quartz, and at the same time creates the highly refractive "fire" for which gems are known. In an improvement to this "standard" way of making paste gems, Neri substitutes "Sugar of Saturn" –what we know as lead acetate. This is a water soluble (and highly toxic) lead compound which can be produced in the laboratory, in an extremely purified state. Chemically, minium and lead acetate will reduce the same way in glass; the advantage of the latter is in its higher purity. Be aware that the colors for the pastes described above can be made more or less saturated according to your will, and inclination, and according to the works in which they will be used. In order to make small stones for rings, the color must be deeper, for larger stones use less color, for earrings, and pendants, concentrate the color. Remit this matter to the discretion of whoever is doing the work. There are no true rules here; the rules given by me above serve only to illuminate the intellect of the curious artisan. To this end, you can always invent and find better colors than the ones that I describe here, other than verdigris, zaffer, and manganese. The curious and noble spirit will be able to get a marvelous red from gold, yet another beautiful red from iron, a most beautiful green from copper, a golden yellow color from lead, a celestial one from silver and a sky blue even more beautiful from the garnets of Bohemia. You will find the small garnets inexpensive, and you can extract their tincture, as I have done many times in Flanders. These materials result in notable effects, and you may do the same with rubies, sapphires, and other gems. All of these things are manageable by a practical chemist. To require me to write such things here would be too much of a tedious matter, especially since I wish to speak succinctly in the present work. However, with the colors described above, you can make very appealing pieces. Because it is such a significant matter, I will repeat once more, that when the pastes are not cooked or purified enough, you should return them to cook again in the same crucibles, taking care not to break them. If the pastes are not satisfactorily cooked and purified, putting them into other crucibles will cause many impurities to form. They will have adhesions from the crucibles, and be loaded with dirt; they will be useless, and not usable for any work. When they are not cooked or purified well, then you should not break the crucibles in any way, but re-lute and return them to the furnace or kiln to cook again. Then they will become pure, and beautiful, to be used in any kind of work that you might want to make.